Web Design Enterprise as a web development company, our specialty is to develop high-end database development any type of businesses. Our database powered solutions drive dynamism and flexibility. A high end database application development platform is a system that lets you update, change and add content to the website dynamically. It can keep a very large amount of information and it easy to maintain and interact with the front-end of the website. Database powered solutions development is needed in interactive websites such as blogging website, online stores, real estate listings, car listings and many other where the users request live feedback from the site. 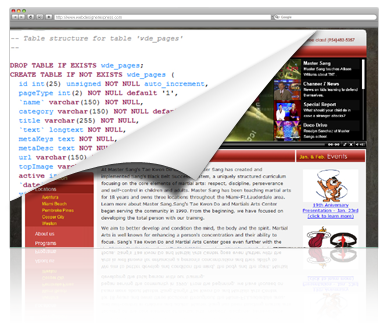 Database development lets us easily update and change content dynamically on the site. There is no need for web developer to do this. Once database is created on your website it will work together with the back-end platform and interact with the user. One of our professionals will teach you the simple steps of working with a backend platform. Web Design Enterprise uses the lasts version of MySQL database. MySQL is a true multi-user, multithreaded SQL database server. MySQL is fast and flexible enough to allow you to store logs and pictures in it. Its main goals are speed, robustness, and ease of use.